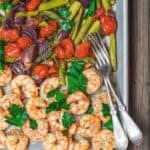 Easy sheet pan baked shrimp and veggies, prepared Mediterranean style! 25 minutes start-to-finish! This is probably not a very cool thing to admit, especially for a food blogger, but here it goes…I don’t like to sweat very much in the kitchen. I’m all for fantastically easy recipes. 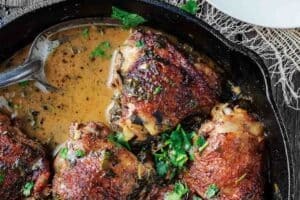 And, you probably know this by now, I’m very much a one-pot, one-skillet, or one-pan kinda gal. 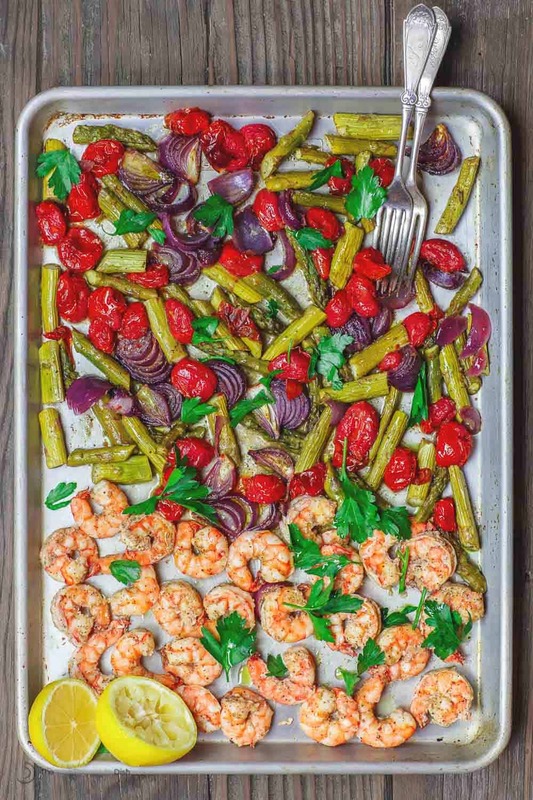 Enter my newest attempt to avoid working too hard in the kitchen: Mediterranean sheet pan baked shrimp and veggies. 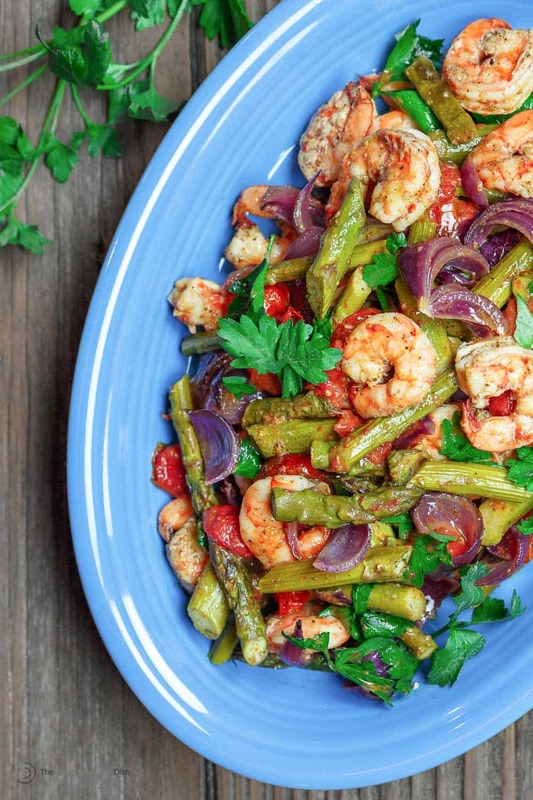 Take your trusted sheet pan, and throw in some veggies (in my case, a bundle of asparagus that was begging to be used, along with some cherry tomatoes and onions), plus a pound of shrimp. Dress them with an awesome sauce. And bake! Now, the kicker is in the secret sauce. 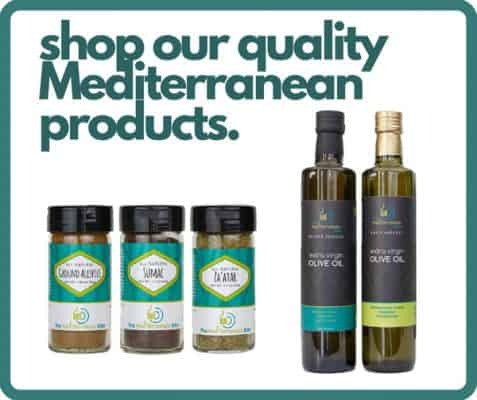 A combination of my favorite Greek extra virgin olive oil, with white wine vinegar, and a couple of spices. Ah, but, since I’ve been on a fresh ginger kick at home lately, I decided a spoonful of freshly grated ginger will do the sauce some good. And it sure did! What else to serve with the baked shrimp & veggies? This baked shrimp dinner comes together in minutes. If you like, add your favorite cooked grains on the side. I often do this Lebanese rice. Need more sauce on top? Drizzle a little tahini. 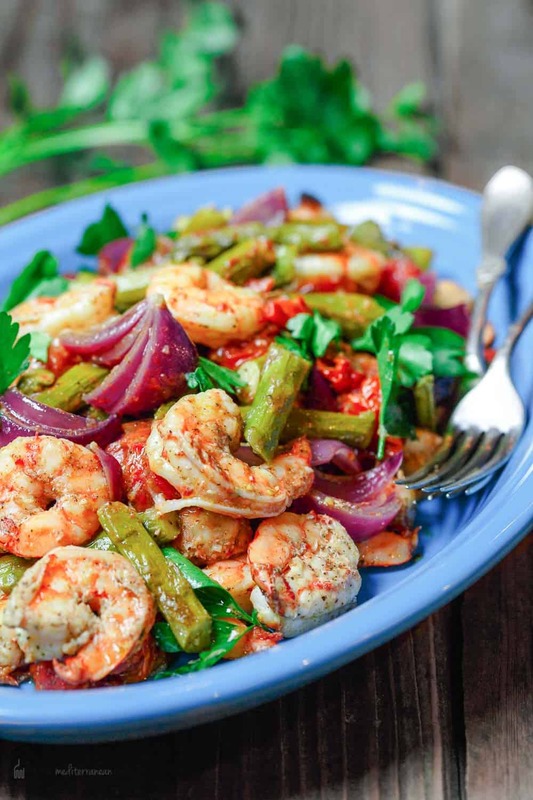 Easy sheet pan baked shrimp and veggies, prepared Mediterranean style! 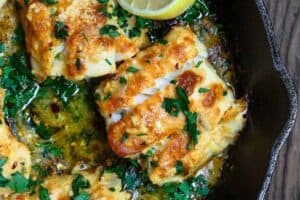 The olive oil and citrus sauce with fresh ginger and spices makes all the difference. Comes together in 25 minutes! Make the sauce. In a small bowl, add all the sauce ingredients. Whisk to combine. Place the vegetables on the largest sheet pan you have (like this one). Pour 1/4 cup of the sauce on top, and work with your hands to make sure all the veggies are well coated. Spread the veggies out in one layer. Bake in heated oven for 10-12 minutes or so. Meanwhile, in a large bowl, add the shrimp. Pour the remaining sauce on top, and again toss to make sure all the shrimp is well-coated. Remove vegetables from the oven. 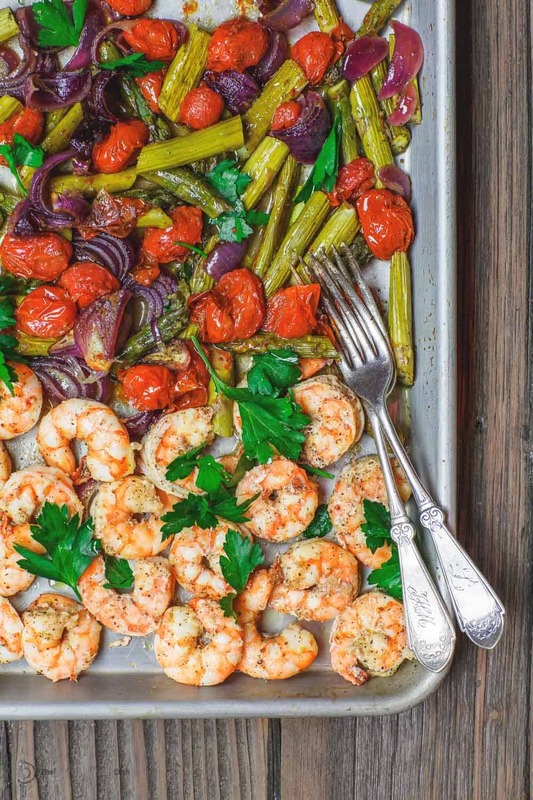 Push vegetables to one half of the pan, and add the shrimp on the other half of the sheet pan. Shrimp should be in one layer, do not crowd. Place pan back in oven. Bake for 5 minutes or so until shrimp is done, do not over-bake. Remove from oven. 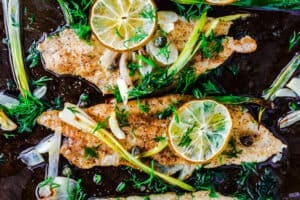 Finish with a drizzle of extra virgin olive oil, freshly squeezed lemon juice, and parsley. 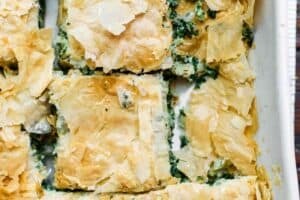 Serve with a side of your favorite grain or this simple Lebanese rice. I am fond of sheet pan meals. 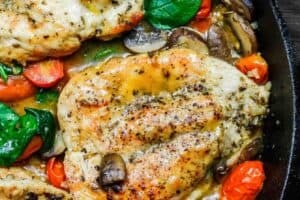 Real food, real fast, and easy clean up! I was delighted with this recipe. Veggies good as most roasted veggies are, but the shrimp was outstanding. I also could not find sumac but read lemon zest or lemon pepper would work. I did not sprinkle with extra lemon juice because the shrimp tasted so good straight off the pan. Did not have the wherewithal to see ahead of time that a bit of rice would make it complete. Still however it was good, like really really good :-). Thank you so much, Anne-Marie! I am so glad you enjoyed it. Yay! So glad to hear it, Leslie! Made this today and it was awesome! Thanks so much for the recipe. Yay! Thanks so much for giving it a try! Omg, this was so good! Couldn’t find sumac locally so I substituted fresh lemon juice and served it over edamame pasta from costco. Definitely a keeper, thank you so much for sharing!